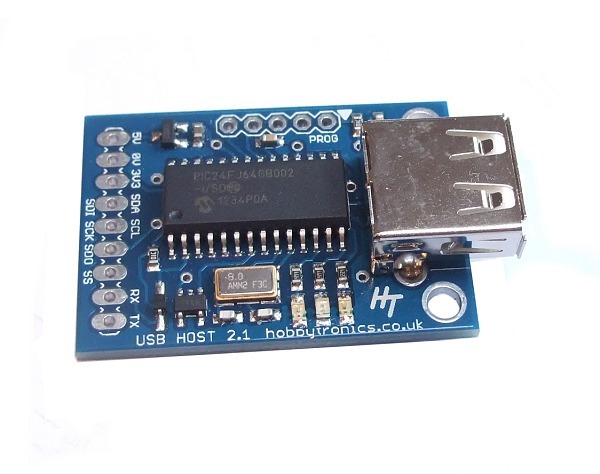 This is a free software download for our USB Host Board and USB Host IC's (SOIC, DIP, SSOP). The USB Joystick software for our USB Host board allows you to easily read the analog stick inputs and all the switch inputs from a USB Joystick. 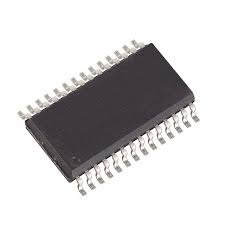 This can give you much more functionality than a traditional Radio Control system and it is much easier to access the control inputs directly in a microcontroller. All the analog stick and button presses are available using either standard serial TTL or via I2C communication. 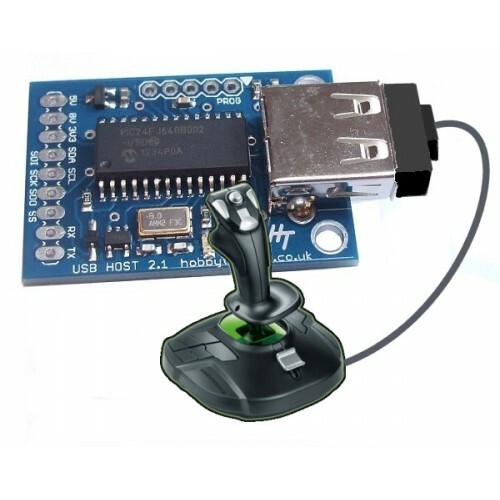 I2C makes for an easier interface to implement directly from a microcontroller but serial TTL is a good choice if you want to use the joystick as a remote control device sending signals wirelessly. The best way to see which axis and buttons are available, is to monitor the serial output. Move the joystick around and click each button and note which value changes. Configuration can be done by sending commands via the serial port. 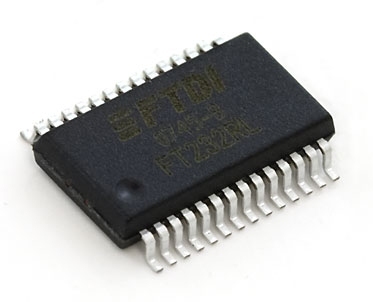 Either by microcontroller or via a terminal program and a suitable serial TTL connection. Commands take effect immediately and are stored in Eeprom on the board. The following Commands are available. SCALE sets the maximum value for the joystick axis. The default is 255. With the joystick in the center position the output will be half this value. This feature allows you to alter the output to match your controlling program. 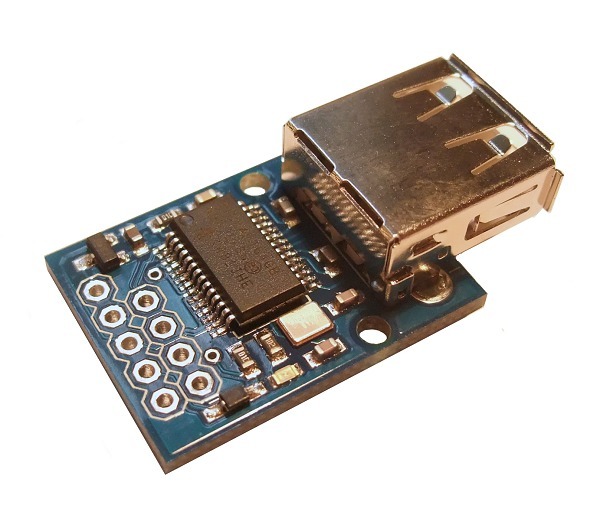 This is useful for instance if you are directly controlling servo's from an Arduino board as the SCALE setting can be set to 180 to give an output of 0 - 180 with 90 being the center position. This directly creates the values needed for the Arduino Servo commands. The HEX option converts the SERIAL output into single Hexadecimal bytes and adds a CRC checkdigit. It reduces the amount of data transmitted and makes it easier to process at the receiving device.It is very useful for transmission of the data via XBee to a remote device. The current settings for SCALE and I2C address are displayed. The output corresponds to the axis and buttons listed above with the axis displayed in order first, followed by the buttons. The last two entries are the joystick manufacturer VID and PID. The output is comma delimited. This is similar to the Serial data output, but each value is output as a single hexadecimal value and there are no comma delimiters. Additionally there is an extra CRC8 checkdigit added to the data to enable the data to be checked for errors. The HEX output is useful for transmission via XBee radio to remote devices. The data is transmitted in the format shown below. You can request all of the data items or individual items or groups of items. As per normal I2C practice, issue a write command and send the starting register address, then issue a read for the data that you require. An example Arduino sketch is shown below and should be easily modifyable for other languages.